Like most mornings this time of year, we wake before the sun. Merritt, snuggled into the contours of my side, pushes off me with his feet and frees himself from the coverlet, shimmying up to sit on our shared pillow. Andy is out of town this week, so there is little choice. I step bare feet to the chilled wood floors, lean over the bed to gather him up in my arms, and remind him that Brother is still sleeping nearby. In a hurry I shuffle around the bed and out into the hallway, to minimize Merritt’s opportunity to wake the entire house. We have lived here for less than a week and I haven’t yet learned our space by heart. I shield Merritt’s eyes to flip on a light. He lets go and scampers off to find his place on the living room couch. I head into the kitchen to tidy up, lifting the trash out of its can and depositing the bag on the side patio. The morning sky is brightening; a blue hue blankets our yard. Our family of recently picked pumpkins cascades down the stoop, and a feisty breeze from somewhere cooler enters my pant leg at the ankle. The long awaited Season is finally here, Fall weather and all. Merritt has found a book to look through. I glance in the cupboard to make a decision about breakfast. A bottle of vanilla bean paste, a bag of semisweet and milk chocolate chips are arranged neatly in waiting. I remember my intention to make hot cocoa this week. It is Monday, which means chocolate for breakfast makes so much sense. Within minutes the mixer is whirring at high speed. Sugar, cream, and vanilla, are whipped into a dreamy shape. Roscoe appears at the door jamb, curls disheveled. He’s curious what Momma is up to. 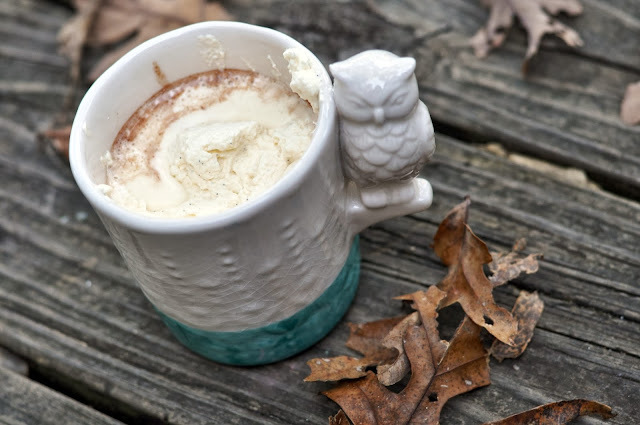 I melt the chips, warm the milk and cream, and combine it together to present drinking chocolate that we top high with sweet cream, flecked with vanilla bean. I pour three small cups and pass them out to eager hands. We sit together in our sleepy state, sipping Fall in the half-dark. In a medium bowl, combine the bittersweet chocolate with the milk chocolate. Add the boiling water and let it stand for 1 minute. Whisk the chocolate mixture until it is smooth. In a small saucepan, bring the milk and heavy cream just to a simmer. Add the chocolate mixture and whisk over moderate heat until hot. Pour into small mugs and garnish as you like! Loved the story...felt like i was there w you guys! Where did you get that awesome mug???? It's from a set of two that I bought for the boys from Anthropologie. They are so small and cute, perfect for little hands. I'm surprised they are still around a year later, as much as they kids use them.